On the crest of the Owen Stanley Ranges, a few kilometres east of the main track, there were two dry lake beds. 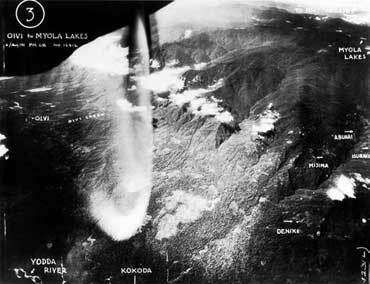 Realising the need for a dropping ground for supplies, Lieutenant Herbert Kienzle of the Australian New Guinea Administration Unit (ANGAU) set out to explore this area and in early August reached the first dry lake, which was covered with kunai grass. It made a suitable dropping zone and he put in train actions to set up a forward supply depot. He named the area Myola (after the wife of his commanding officer). Nearby, and at a higher altitude, was a second dry lake, which became known as Myola 2. Myola was quickly developed as a forward supply depot and became the location for medical posts established by elements of the 14th and 2/6th Field Ambulances under Major J.R.Magarey. During the withdrawal the Australian battalions gained a much needed resupply of clothes and food at Myola before the location was evacuated on 4 September. During the counter-offensive the 25th Brigade reached Myola on 8 October and quickly began to develop the area as a supply depot, relying on supplies dropped by aircraft, known as biscuit bombers, on the open dry lake. Also the 2/4th and 2/6th Field Ambulances established medical posts which were soon receiving casualties from the 25th Brigade fighting at Templeton’s Crossing and later the 16th Brigade at Eora Creek. It was hoped that a landing strip could be cut that would allow casualties to be evacuated by plane, but the first light plane did not land until late October. However, there were insufficient light planes and several crashed on landing at Myola. Only about 40 casualties were flown out of the mountains. There were not enough native carriers to carry all the wounded out to Port Moresby and many remained in the hospital at Myola until they had recovered sufficiently to walk out themselves. Patients were carried out as carriers became available, with the last reaching the Port Moresby area shortly before Christmas 1942. Myola was an important post for the operations of 1 Australian Corps Signals in constructing and maintaining a telegraph wire across the Owen Stanleys from Moresby to the Gona/Buna areas (Popondetta/Dobodura).